In an “SNL” sketch last night, Democrats unable to find the appeal of newly elected Scott Brown were swooned by a winking, shirtless Jon Hamm. 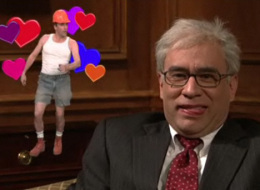 The guest host was hilarious impersonating the Massachusetts Senator, perfectly playing the role of hunk and showing up in the fantasies of Nancy Pelosi, Barney Frank, and others. 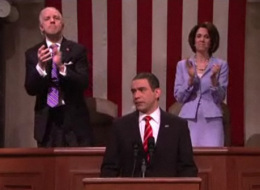 SNL took on the State of the Union last night, cutting together clips of Fred Armisen as Obama with actual shots of displeased Republicans and ecstatic Democrats. Mocking the actual response to the speech, the sketch repeatedly cut to Democrats wildly applauding, then juxtaposed them with stone-faced Republicans. But a surprise attendee, Brendan Fraser, was won over, as he reacted with his signature clap. Tea Party Nation organizers today issued a long defense of their unraveling convention, lambasting former members they say are trying to harm the movement and outlining for the first time in great detail their event’s sponsorships and problems. We’ve been following the travails of the upcoming Tea Party Nation convention for weeks, with key speakers withdrawing and the Tea Party Express group backing out as well thanks to feuds over the cost and expected profits of the convention. “We will stay silent no longer,” she wrote. She goes into detail about convention sponsors American Liberty Alliance, American Majority and Campaign for Liberty, and said the Tea Party Express only withdrew because of their push to unseat Senate Majority Leader Harry Reid in Nevada. She calls out “former Tea Party Nation members” for “discussing their association with liberal media outlets” and “conspiring” to harm TPN and the convention. PORT-AU-PRINCE–Every night since losing her home to the devastating earthquake that reduced much of this country to rubble, Marie Carole Joseph, 54, has slept under open skies with not even a bed sheet for protection. “No one has said anything about a tent to me yet, but if they have some I would like one,” says Joseph, a mother of three. The Haitian government is urgently requesting 200,000 family-sized tents be shipped to the partially destroyed nation for use as emergency shelters for its burgeoning homeless class. The international community has not been quick to respond. “Blair lied, thousands died.” That was the chant which reverberated around Parliament Square on Friday as former prime minister Tony Blair gave evidence to the Iraq inquiry. Even from the safety of the Queen Elizabeth II centre, where he had been spirited by his security detail hours before the inquiry was due to start, Mr Blair could not have failed to hear the fury of the hundreds of protesters who thronged the square throughout the morning. Sarah Palin confirmed on Greta Van Susteren’s show last night that she’s very much planning to show up and speak at the National Tea Party Convention in Nashville, despite the distinct odor of Scam the whole affair is giving off. Palin: Oh, you betcha I’m going to be there. I’m going to speak there because there are people traveling from many miles away to hear what that Tea Party movement is all about and what that message is that should be received by our politicians in Washington. I’m honored to get to be there. In separate statements, released by their congressional offices, the lawmakers said that appearing at the convention might conflict with House ethics rules. But they also said they are concerned about how money raised from the event will be spent. Palin: The speaker’s fee will go right back into the cause. I’ll be able to donate it to people and those events, those things that I believe in, that will help perpetuate the message, the message being: Government, you have constitutional limits. You better start abiding by them. Hmmmmm. It sounds like we’re going to have to rely on Sarah’s say-so when it comes to how she actually spends the money. Smells even more like Scam, doesn’t it? Of course, the whole scenario, as David Corn explored with Keith Olbermann last night, is developing into quite a fiasco — mainly because Tea Partier and Birther J.D. Hayworth has decided to challenge Palin’s former running mate, John McCain, in the Arizona Senate primary. She is certainly entitled to write a book and make money for her and her family, but other than what has she has done to support Republican and patriotic candidates. … Perhaps, Sarah was too busy talking to her agent about her Fox deal. Where the hell was Sarah? This is what you get when you build a movement around paranoid right-wingers. There is probably no faction more historically famous for viciously turning on each other in struggles over money and power than right-wing populists. Couldn’t happen to a nicer bunch. Former prime minister Tony Blair defended his decision to take Britain into war with Iraq, telling an investigation panel that he would do the same again if he had to. Telegraph View: The great and unforgivable error was not the invasion of Iraq, but failing to prepare for its aftermath. Anyone who thought that the former prime minister would suddenly resile from his view that the decision to invade Iraq in 2003 was justified by a genuine belief that Saddam Hussein was building an arsenal of weapons of mass destruction was always going to be disappointed. Recantation or tearful pleas for forgiveness may be the stuff of some daytime TV shows; but this particular one was not going to provide them. “No regrets at removing Saddam Hussein. He was a monster and a threat. The world is safer as a result. He reflects on his decision every day.